Experience a spectacular series of world-class intimate concerts by leading national and international artists presented at the Eudlo Hall, located in a hidden tranquil Hinterland valley, Sunshine Coast, Queensland, Australia. Acoustically brilliant, visually stunning, enticingly tranquil, elegantly programmed, dreaming BIG Concert Series offers audiences a thrilling glimpse into the heart of classical music with a rare opportunity to get up close, mingle and engage with guest artists. Simply put, you can’t experience dreaming BIG anywhere else. Come on a musical journey and attend the full series or come to your hot pick. Share the experience with someone you adore, a kindred spirit who understands that the finer things in life can happen right here, right now, right under our very noses and in our own backyard. Experience BIG city culture in a small hall. After a thrilling sell-out season last year, I warmly invite you to the second dreaming BIG Concert Series for 2015. Expect spectacular music, inspirational world-class performances, engaging artist talks, enticing diverse programs and post-concert mingling with guest artists. Engaging, informative and educational, these concerts are great for music lovers, perfect for introducing classical music to a younger audience and are fabulous fun for those who fancy trying a new experience. BOOK $45 music lover | $35 concession & early bird | $20 student | $100 family | $100 group of 4 adult tickets Indulge Series Pass, Music Lover Bundle, Student Rush tickets available. Performed by Australia’s leading and most exciting musicians in contemporary classical music, this beautiful chamber music event, celebrates music written by women, played by women. Yes, men are very welcome to attend! 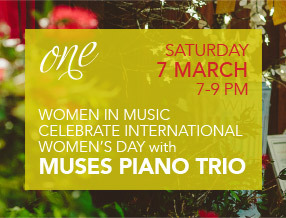 Known for their edgy, spine tingling and virtuosic performance style, Muses Piano Trio is excited to again be the launch performance for the 2015 concert series. Believing music written by women deserves to be better known by audiences, Muses Trio unearths hidden musical treasures and brings them to the concert stage. If you have a passion for trying new things and are musically adventurous, this concert is not to be missed. Promising to be a night of musical adventure, social connection and vintage elegance. An exclusive International Women’s Day event for the Sunshine Coast presents an opportunity to unite, network and mobilize for meaningful change in our community and highlight talent in our creative industry. Discover your inner gypsy with an exhilarating program of spicy and exotic folk works for solo cello followed by an exposé of original music by instrument maker, mad looper and musical innovator Linsey Pollak. This concert features invented instruments played by Linsey Pollak with Tunji Beier on world percussion, Philip Griffin on electric bass, oud and concert cellist Louise King. The brand new book and album ‘Mrs Curly and the Norwegian Smoking Pipe’ will be for sale at the concert. Expect virtuosity, musical pyrotechnics and rhapsody in this exclusive afternoon concert presented in partnership by Cello Dreaming and Collusion, Ensemble in Residence at Griffith University Queensland Conservatorium. Bringing the best of Queensland’s finest classical musicians to the Sunshine Coast for an exclusive program, hear world-class music for chamber orchestra featuring strings with winds. Players are invite only and are truly exceptional and seasoned performers. Classical music to romance, relax and be enraptured by. A pioneering and exceptional musical coup for the Sunshine Coast, vibrant and dynamic leading musicians from Australia’s newest period orchestra, orchestra seventeen88 are invited to perform an exclusive Sunshine Coast performance of their latest chamber music project. Specialising in performing the classical repertoire on period instruments with Historical Informed Performance Practice at a world-class level, music lovers will be treated to an incredible musical experience including an interesting concert talk with anecdotes about the music, classical style and their original instruments. Promising to be an evening of educational reveals, pure stylistic detail and exhilarating world-class music making. Across the globe, audiences flock to experience the intimacy and meditative power of Bach’s music. Artists paint to his music, dancers dance, poets write, now you can come and experience for yourself what it is about his music that endures and captures the imagination. This concert celebrates the beauty, the joy and the pure genius of J.S. Bach’s music for cello as a solo voice and with sparkling harpsichord. Experience an incredible intimate musical experience fit for any international music festival around the world. Cello Dreaming Youth Ensemble as guest support. Promising to be a star-studded musical highlight of the 2015 series, the Endeavour Trio is a magnificent combination of clarinet, cello and piano. Comprising three outstanding Australian musicians, the Endeavour Trio offers audiences the highest caliber performance of chamber music works from the Classical, Romantic and Contemporary eras. Beethoven and Brahms first noted the unusual but immensely congenial relationship between these three instruments, forging a path for many composers to follow. This will be an exceptional performance with stellar musicians that you will not want to miss. Guest choristers from Sunshine Coast Choral Society with music director Adrian King, Louise King solo cello with solo percussionist, featuring Cello Dreaming Community Ensemble directed by Louise King. Experience a magical Christmas the traditional way with uplifting carols, good cheer, family and a festive atmosphere. Unashamedly classical and sentimental, this special festive concert features everything to make even the meanest of Scrooges become enchanted with Christmas. Bring your best caroling voice and be introduced to the delights of a fine musical Noël. 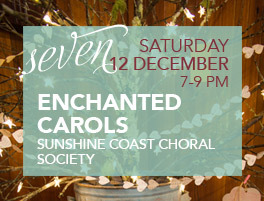 Listen to guest choristers from the Sunshine Coast Choral Society directed by Adrian King sing like angels in traditional carols arranged by contemporary English composers featuring solo cellist Louise King with sparkling glockenspiel, handbells and percussion. in the Dreaming Big Concert Series, which enjoyed many full house performances in 2014 and 2015. The future of Dreaming Big is currently being caressed and assessed and I would love your feedback if you were a part of the Concert Series. Please contribute your thoughts in a quick online survey, which should only take a few minutes of your time. ‘It was an amazing experience to hear you last night, a truly world class musician playing for us in our own ‘backyard’! During 2014, a new and enthusiastic audience for classical music was born with a total of seven triumphant sell-out classical music events, bringing over 900 people in just one year to a small hall in a rural and regional area to experience Louise’s BIG musical vision. ~ 78 musicians performed in dreaming BIG including guest artists from Melbourne Symphony Orchestra, Queensland Symphony Orchestra, Australian Chamber Orchestra, Queensland Conservatorium of Music Griffith University, University of Queensland, independent professional musicians, platinum award winning ARIA singer –songwriter Katie Noonan. ~ 45 community musicians and professional string teachers from the Sunshine Coast and Brisbane region were involved in a pilot performance project launching the Sunshine Coast Chamber Orchestra and the dreaming BIG orchestra and choir. Are you a Local Music Hero? Want to see your business supporting a community cultural enriching project? Do you fancy volunteering backstage, front of house or helping get the word out about the series? Get in touch. Dreaming BIG is SO Much More Than A Concert! Are you a rising classical star? Do you know a young talented instrumentalist, vocalist or ensemble looking for local high profile performing opportunities? Artistic Director Louise King loves to invite Sunshine Coast community music groups and local school ensembles to perform as support acts for the series. These guest support acts provide ambient background music while audience is greeted and settled pre-concert and give emerging young musicians and community groups’ valuable performing experience and opportunities to be seen and heard by the public. Did you know that dreaming BIG Concert Series provides an opportunity for Sunshine Coast artists to exhibit their works at public concerts? dreaming BIG actively promotes and exhibits Sunshine Coast leading artists through a powerful alliance with Maya Carter-Mallins of Rosebed Galleries Each concert in 2015 will have an exclusive art exhibit on stage especially curated for the event. Are you an artist and interested in growing an audience for your artwork? Please contact Maya with your EOI. Community Halls are not known to be the most suitable venues to promote and present fine cultural experiences, musical beauty and global glamour but with clever styling and hours of hard work, dreaming BIG concert stylists and volunteer team make the venue look truly spectacular. Each concert is individually styled and themed to create a visually enticing spectacle. dreaming BIG concert stylists include Lovebird Weddings and French & Gorgeous Interiors, Cooroy. If you fancy joining the styling team, please get in touch. Did you know that dreaming BIG Concert Series provides not only a platform for high profile professional chamber musicians to perform and connect with an enthusiastic audience but also actively encourages emerging Young Musicians to attend the educational workshop program with visiting musicians? Young Musicians can also volunteer to turn pages for professional piano players, help as event volunteers, attend open rehearsals with guest musicians, perform as pre-concert musical entertainment, learn the ropes of Front Of House and experience the behind the scenes buzz of producing a public concert including stage management. dreaming BIG Concert Series can produce community performance projects that are designed to engage and enrich the community by inviting leading guest professional musicians, renowned conductors and inspiring music educators to rehearse, train, mentor and perform with established instrumental teachers and young aspiring musicians from the Sunshine Coast. Please see Sunshine Coast Chamber Orchestra project. This project acknowledges recent financial contribution from the Regional Arts Development Fund, a partnership between the Queensland Government Arts Queensland and Sunshine Coast Council to support local arts and culture in regional Queensland.